My story with this cartridge started a couple of years back, when Nullsleep, aka Jeremiah sent me one for free, for the purpose of figuring out the protocol. 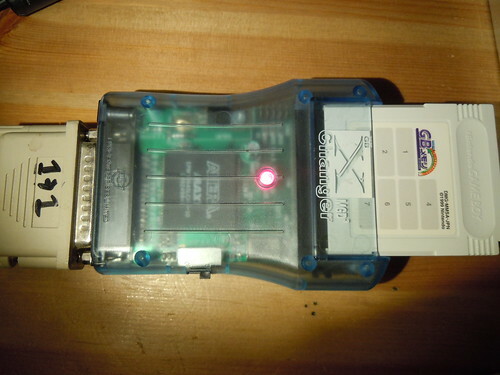 At the time, I did not have access to an easily programmable flasher (more on that later) so my best way of trying to interface this cartridge was with a cartridge swap technique. I would write a special program which I would burn to some other cartridge. Said program would copy itself to the Gameboy’s internal RAM. I would then remove the source cartridge and insert the target cartridge, in this case the Nintendo Power cartridge. This method was unstable. The Gameboy would often crash or otherwise misbehave. Flash chips typically communicate through a protocol where you give it commands by writing standard sequences. One such common sequence is: $AA to address $5555, $55 to address $2AAA, $90 to address $5555, which enter silicon ID mode. In this mode, you can detect the manufacturer and chip model. Other commands include, program, erase and, depending on the manufacturer and model, memory sector protection. I tried different versions of these commands, to no avail. I soon gave up with finding the secret to the Nintendo Power cartridge. Fast forward a couple of years, I once again regained my interest in this cartridge, and one thing I tried in order to find clues about how to flash it, was to look at the Nintendo Power menu program that came with the cartridge. I did not find any clues on how to access the flash, but I did find a little secret. If you press all button simultaneously, you get to a debug screen, which performs a couple of self tests on the cartridge. Clearly you cannot hold all eight buttons (including all four directions on the D pad) simultaneously, so this must be a feature designed for a special device with all the buttons hardwired to be pressed in order to boot into this test. The jump takes place at position 017D, and if you want to make the ROM always boot the test, you can change bytes 017D and 017E to 00. The screenshot shows a further modified version of the ROM which does not stop if one single test fails. The tests “bank change” and “checksum” are straightforward. Bank change checks basic MBC type functionality. 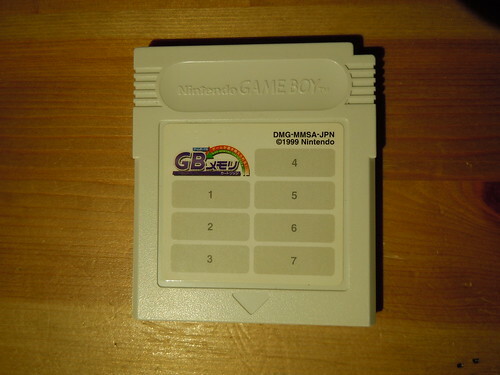 Checksum calculates the ROM checksum in GBC single and double speed mode. Presumably it would fail if the flash chip has a too low speed grading for the GBC double speed mode. The menu sequence and decode data are more interesting. They write to and read from a number of memory positions in the 0120-013F memory range. These are clearly IO registers of some sort, which are inconspicuously placed in the area that is otherwise used for the cartridge header. I knew this was significant, but didn’t really know how to use it to write to flash. Fast forward some more to this week. I now finally have a Bung GB Xchanger, which I can connect to my rusty old LPT laptop. I can confirm that I can indeed use this FMGBx plus the Xchanger to write ROMs to the cartridge. I wrote a ROM to the cartridge, that I created, which allows code to be downloaded over the link cable. I’m using this together with the Nanoloop adapter for a quick development cycles so I can do experiments easily. Now comes the difficult part. I can either write blindly to the cartridge and hope to find something interesting, or I can reverse engineer this software. Well, I don’t care, let’s reverse engineer it. Let’s find out from the inside how this works. This is the process that took hours and a lot of frustration. Even though IDA (a nice disassembler) does a very good job at disassembling and organizing the code flow visually, you still need to find what you’re looking, which can be like finding a needle in a haystack. Even though it may seem easy when condensed to a text like this, it can be painstaking. So after a while, I did find the function that writes to the LPT port. Check xrefs. Find various functions calling it. Find various functions calling that. Get tired and go make some food. Get back and lose my train of thought from before. Make a hypothesis about which code path is for the NP cartridge. Test hypothesis on the Gameboy and find it to be incorrect. Have doubts about the exact format of the LPT write function. Decide to create a “detour” DLL which is injected to the process and hooks all IO accesses and logs them to a file. Struggle with this while learning. Transfer the DLL to the LPT lappy. Program crashes because of badly formatted DLL code. Rinse and repeat. Fix the error and copy the DLL to the laptop yet another time. Be unsure for a bit more, how exactly the logged data is formatted. Spend some time trying to correlate the log data to the disassembled machine code. Form a couple of hypotheses on what exactly the code does and try them on the Gameboy. Still nothing. This would for example write the value $83 to the address $2AAA, as part of some flash command. The three supposed writes to 0120 were done with such repeated _write_port_data calls. However, those repeated calls had an automatic increment of the address, so the actual addresses were 0120, 0121 and 0122. 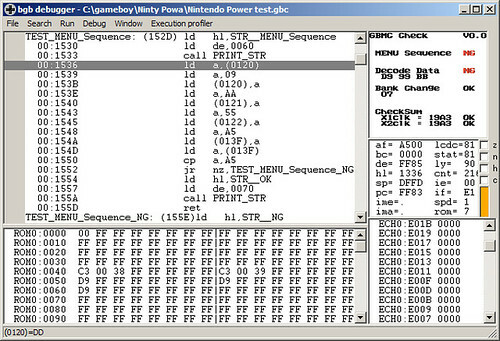 I realized this when looking back for a second at the menu ROM disassembly in BGB shown above. And this was actually the last hurdle before I could successfully do a silicon ID command to the flash chip and get back that the manufacturer ID is $C2 (Which means Macronix, just like it says on the chip) and the device ID is $89. In other words, the Nintendo Power cartridge is officially unlocked. In the future, I will come up with some more user-friendly way of flashing these cartridges, but this week’s project ends here. Here’s a cathartic proof of concept: a program that is loaded from the computer over the link cable (this has been my development setup for probing the cartridge) and prints some information about the cartridge, and then erases the cartridge. When rebooting the cartridge, the logo is empty, which shows that it hs been erased. Btw, if you look inside the cartridge, you can see that the RAM chip, UT621024, is clearly a 128 kiB chip, but apparently LSDj can only access half of that. I can probably fix that in LittleFM so the full 128 kiB can be used. Great trial and error work. Tedious troubleshooting does not always pay off unless you have the patience to work through problems. You seem to be able to do that very well. I have one of these cartridges, how much do you think it is worth nowadays? Were you able to register the software Flashman GBx? I have emailed Mootan, but have not heard from him. I’m doing as you say above. I was able to acquire a GBX transferer, so now I just need to register my software. Thank you for any help. can’t understand neraly anything about programming, but i readed all the history and i loved it. Wow, nice work. So you got the information about pressing all the keys together by looking into the code of the Nintendo Power menu program? Yeah. I was single stepping through the program from the beginning and noticed that weird button check. Great job! But it’s so difficult. Can you share the flash instruction to get the device ID? This page was previously hosted on http://gameboygenius.8bitcollective.com/wordpress/2013/02/25/gameboy-project-week-8-the-white-nintendo-power-official-flash-cartridge-a-tale-of-reverse-engineering-sweat-and-tears/ (*).